“I had never listened to NPR,” the 30-year-old music teacher said. “NPR was kind of old-people stuff.” But “This American Life,” with its funny, moving stories of everyday people, was different. LaPerle fell hard: He started catching up on old episodes in marathon sessions. LaPerle eventually discovered there were live storytelling events going on all around him. Throughout the year, local and national groups put on dozens of shows in and around Boston. Massmouth, Story Space, Story Collider, Speak Up,Mortified, and The Moth itself routinely host events pairing those with something to say and those clamoring to hear them say it. Storytelling is, of course, among the oldest forms of entertainment. According to longtime observers and participants in the storytelling scene, one contemporary iteration, the competitive slam, with its emphasis on vulnerability and confession, has arisen and spread in the past 15 years or so — a period that also saw the ascension of reality TV, tell-all memoirs, and share-all social media. Storytelling events are growing in popularity all across the country thanks in part to the New York-based nonprofit The Moth and its radio reach. 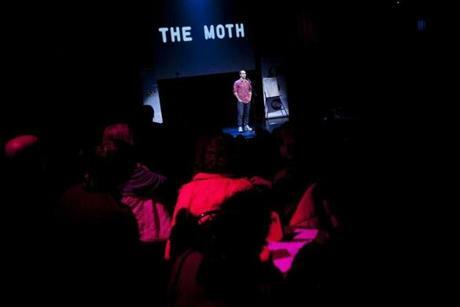 The Moth started in New York in 1997 as a live storytelling event and quickly gained a following. It drew performers from those outside the storytelling world: writers, actors, and comedians all took the stage for its events. In 1998, “This American Life” aired a segment on a yarn about a road trip performed at a Moth event and introduced the series to a national audience. Since then, The Moth has toured the world and in 2009 debuted a public radio show of its own called “The Moth Radio Hour,” now airing on 200 stations nationwide. In September, it started a series of monthly story slams at Cambridge’s Oberon, the second stage of the American Repertory Theater. 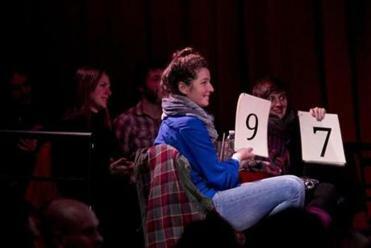 Counting its Massachusetts events, The Moth hosts slams in 11 cities at 14 venues. In 2007, it put on 62 shows; this year the total hit 221. Mike McDuffee performed during the Moth StorySLAM. LaPerle’s favorite Moth story, delivered in Aspen, Colo., by comedian Anthony Griffith, is also among The Moth’s most popular. In it, Griffith talks about struggling to launch a successful comedy career, his back to the wall financially, while his 2-year-old daughter’s cancer has returned with a fury. A YouTube video of the performance has been viewed nearly a million times. LaPerle returns to it regularly and gets choked up every time. He decided to make the leap from listening to talking when cancer touched his own life: His mother was diagnosed in March. Suddenly, he was seized with the desire to speak publicly about his family’s experiences with cancer — but he figured he’d start small. A few months ago, he and his girlfriend made a pilgrimage to New York to attend a Moth slam. Instead, he got lost in the Bronx. He planned to tell a story about that at a Moth event at Oberon in early December. Performers at Moth slams are chosen at random, and LaPerle put his name in to be called up to the stage. It was a bold move: More than 200 people packed the sold-out club. A luminous Moth logo — “The Moth” spelled out in white letters over an abstract background — was projected onto a giant screen at the back of the stage. Between stories, local writer Steve Almond gently heckled contestants and judges. Storytellers were competing for a slot at The Moth GrandSlam. “The winner of that gets to date [‘This American Life’ host] Ira Glass,” Almond quipped. What’s more, they were getting a chance at a national audience: The Moth airs stories from its slams on its podcast and radio show. The theme of the night was “happy accidents.” As LaPerle waited for his name to be called, he listened to tales of car accidents, cancer diagnoses, and vacations gone awry. The night’s winner, Rebecca Nesson, told a story about a high school study-abroad trip to Ecuador during which she felt excluded by her preppy peers but made friends with the locals, ending with a dance party and a decision to switch to public school. “The Moth brought storytelling into mainstream culture. We’re just one of many little boats following it,” said Norah Dooley, professional storyteller, executive director, and cofounder of Massmouth. At Oberon’s December StorySLAM event, judges score a storyteller. Massmouth is by no means a small operation. From October through April, the four-year-old nonprofit hosts four or five slams a month at venues throughout Boston, culminating in a final competition that routinely draws more than 400 people. 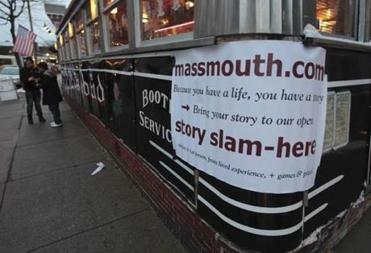 Massmouth teaches storytelling in a handful of area public schools and provides workshops for adults interested in honing their craft. Its website has video documenting most of its events; it even has its own social-network page where members can post a photo and a bio and contact one another, a sort of Facebook for storytellers. Dooley has been active in the Boston storytelling community for more than 20 years. She first became acquainted with the practice in the late 1980s when she started listening to a public radio program called “The Spider’s Web,” on which WGBH alumnus Lee-Ellen Marvin would recruit local storytellers to read from children’s books. But in the last decade, Dooley became aware of something brewing in other cities. Story slams, with their emphasis on personal revelation and competition, seemed quite different from the milieu to which she had grown accustomed. What’s more, they were bringing in a new crowd, one younger and larger than that at the Around the Fire annual storytelling conference. At the center of this narrative explosion: The Moth. “For once in my life, I was in the right place at the right time to catch a cultural wave,” Dooley said. She started hosting story slams modeled after The Moth’s, scoring the tellers and charging admission. “Story slams were our first decisive action,” she said. “There had always been open mike and poetry slams, but never a story competition.” Storytellers at Massmouth and The Moth nominally compete for a chance at the finals and free tickets to subsequent events, but scoring the tellers has less to do with prizes than it does with raising the stakes of getting onstage. To attract a younger crowd, Dooley created a MySpace page — and it worked. Those in the traditional storytelling community, Dooley said, had been resistant to getting online and initially were less than pleased by the cover charge and competitive atmosphere. But over time, she said, they’ve come around — some even turning up to compete at slams. In September, Massmouth faced some competition of its own when The Moth launched its monthly slam on the same night as the regular Massmouth event at Club Passim in Harvard Square. Dooley was nervous at first, especially because each Moth performance has sold out. Even though he didn’t get a chance to tell his story at The Moth contest, La Perle left the event inspired enough to attend a Massmouth storytelling workshop the following weekend. While there, he jettisoned his Bronx story for one about a car crash that happened when he first moved to Massachusetts. The instructor helped him build its arc. Days later, he attended a Massmouth session at the Rosebud Diner in Somerville. The atmosphere was decidedly more low-key. A man in a sweater and jeans aimed a lone video camera at the microphone stand looming in the center of the stage. By the time the event started, around 40 people had filled the tables in front of the stage, spilling over into an adjacent room. That day’s theme was “alien.” A featured guest, UFO investigator Steve Firmani, took the stage between stories to make the case for extraterrestrial life. LaPerle was the first teller called to the stage. He was ready. His talked about his car accident, what it was like to move away from his family, and the kindness of strangers. The audience laughed, gasped, and when he was finished clapped heartily. After a few minutes, the judges had a score: 9.1. It felt “like jumping into a cold pool,” LaPerle said — scary but exhilarating. He was thrilled to finally be a part of what he had so long admired. “I’m really happy my first time was at Massmouth,” he said. Eugenia Williamson, a writer and editor in Somerville, can be reached at eugenia.williamson@gmail.com.